As you can see, there is still a lot of green to go! After green, I think I might tackle the sky. They sky should not be too bad. The pieces are easily identifiable as to what orientation they fit in and it appears that like maps, they contain rows of "odd" pieces which greatly aids in the finding of pieces! Occasional it appears that there are a pair of ultra "odd" pieces in a non "odd" piece row. But these appear to always come as a pair of a three knob/three receptacle piece so that the pair would continue the otherwise normal 2knob/2receptacle pattern. I included a pic of the 6 type/orientation pieces below. He is coming together nicely. I need to figure out whom he is supposed to be. Anyone know? 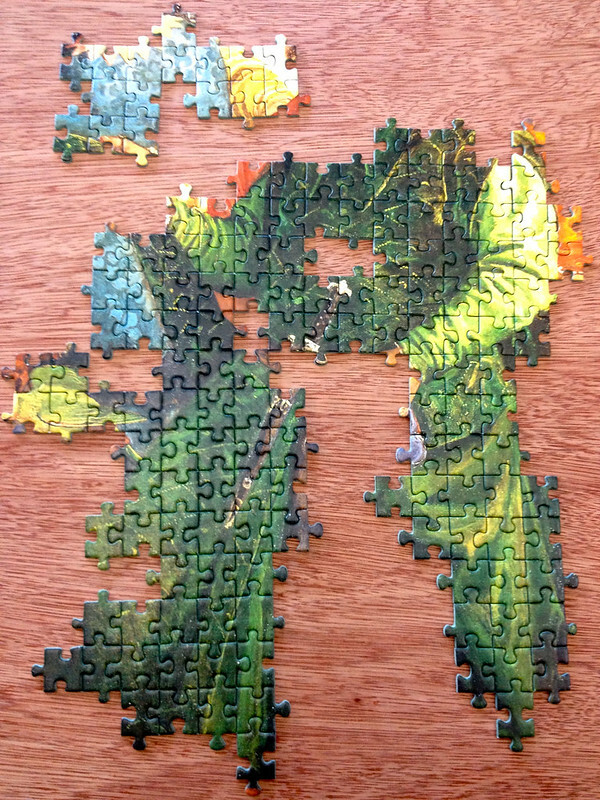 These are all of the different pieces/orientation in the Ravensburger's 9000 pc Wedding Feast at Cana. The "standard" shapes at right are easily distinguishable between vertical and horizontal pieces. 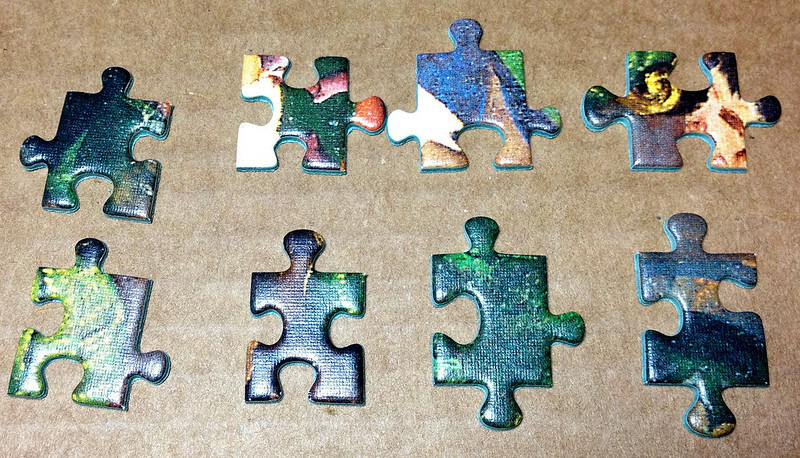 The puzzles appears to contain entire rows of non-standard pieces which makes finding them very easy. Occasionally, their are a pair of the vertical orientation 3 prong and 3 receptacle pieces. 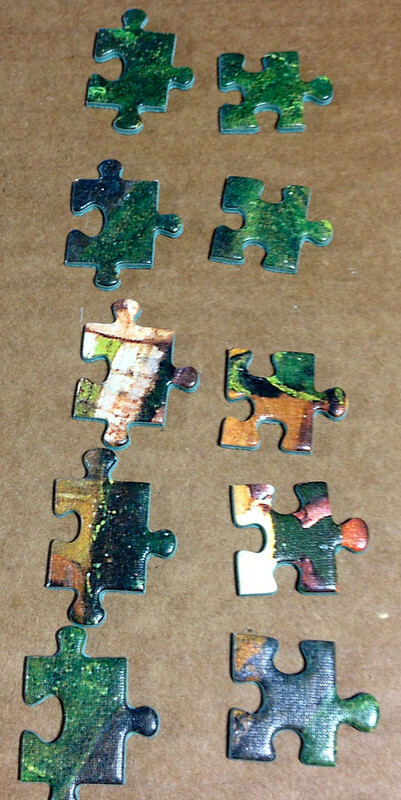 In a sort of over 500 pieces, there were only about 8 of these pieces. The vertical 3 prong and horizontal 3 receptacle are always placed next to each other in a row of normal pieces. These are found very infrequently in the die. The state of things. 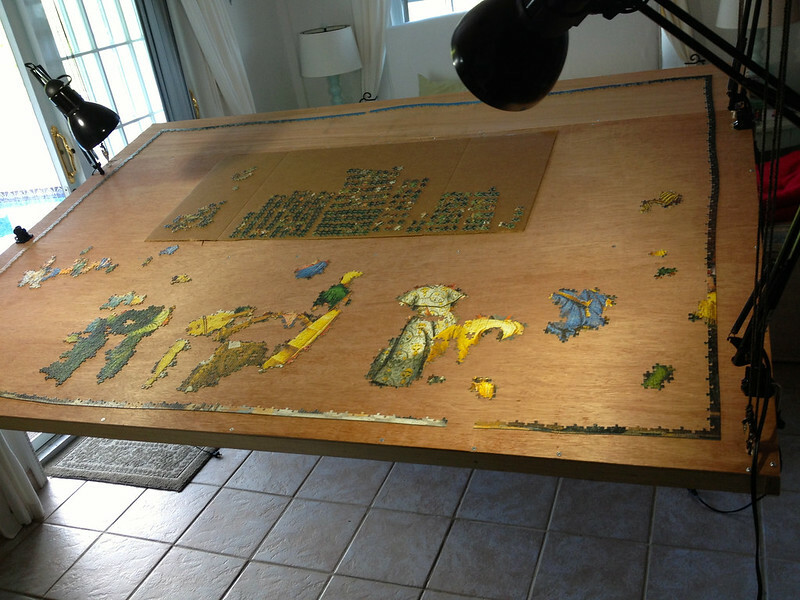 It's nice to finally be able to lay out the entire puzzle with the puzzle table extension complete.